Hansen’s former boss is a global warming sceptic! Turn off your airconditioners because it is too hot today! Need a laugh? – Leprechauns cause Global Warming! Coalition joins the climate change fight – but without an ETS? Global financial crisis – what would you do if you were dictator for a day? Now you have to admit this story has WOW factor. I have copied it straight off An Honest Climate Debate’s website. Just click the website name and that will take you there. He has heaps of other very interesting stuff on his website. The reason I have copied this in full is because the contributor asked for his story to be broadcast as widely as possible. I am helping to oblige his request because I have questions. (Yes, I am sceptical. An occupational hazard!) I am hoping the wide range of readers that drift hrough this website will be kind enough to answer them. Is he comparing apples with apples? ie change to anthropogenic global warming to change in solar influenced warming? Do these arguments hold water scientifically? Until now the climate alarmists exploited their untouchable status within the shelter of the Department of Environmental Affairs and Tourism. This has come to an end. Our studies confirm that variations in received solar energy and not atmospheric discharges by burning fossil fuels are far and away the dominant cause of climate variability. We can demonstrate beyond doubt that reductions in greenhouse gas emissions will not have the slightest effect on South Africa’s climate now or in the future. Please distribute the attached memo widely. The scientific advisers to the South African Department of Environmental Affairs and Tourism have created the impression that climate change is one of the greatest threats to our planet and to our people. This statement is totally false and misleading. As shown in this memo, during the past five years the range of received solar energy was 28 units compared with a range of only 1.6 units resulting from human activities. Reducing undesirable emissions arising from burning fossil fuels will not have any measurable effect on climatic processes. This conclusion is confirmed by comprehensive studies of our extensive hydro-climatic database during the past 30 years. These studies demonstrated the unequivocal linkage with variations in solar activity and complete lack of evidence of the effects of human activities. The Minister is urged to appoint an independent, multi-disciplinary commission of enquiry to advise him before he commits South Africa to undertake costly and fruitless measures that can only damage our economy at a time of a global economic recession and rising unemployment. The Minister is further informed that South Africa has now entered a period when severe subcontinental droughts can be expected. The basis for this prediction has been denied by his advisers. I must also record that the Minister’s advisers are well aware of our studies but have rejected my frequent suggestions that we meet to discuss our differences on this nationally important issue. The Midrand Summit is only four weeks away. The South African authorities are about to make some irreversible decisions that will affect the future prosperity of our nation and its citizens. There will be no benefits — just penalties. This might be in order if we were facing a national emergency but we are not. There is no enemy at our gates. The threats are entirely imaginary as this memo demonstrates. I am reminded of Adolf Hitler’s infamous statement that the bigger the lie the more believable it will be. I also recall Winston Churchill’s rallying cry that we will fight them on the beaches, we will fight them on the landing grounds, —- we will never surrender. Am I exaggerating? Here is yet another example of a big lie perpetrated by climate alarmists. It goes to the very heart of the issue. I received several responses to my request for one-page contributions that challenge the underlying science of climate change. I have attached a one-page comment from Fred Bailey in the UK. Here is some background to his comments. Everybody accepts that solar energy received on earth drives the earth’s climate. It must follow that changes in the received energy will result in corresponding changes in climate. It is also elementary knowledge that the magnitude of the received energy will depend on the earth’s distance from the sun. In the attached note Fred Bailey demonstrates that wattage changes in the range of 30 Wm-2 have been taking place over millions of years. Compare this with the IPCC’s figures below. Climate alarmists have gone to great lengths to discredit the influence of variations in solar activity on climatic variations. They are forced to do this in order to establish their claims of exclusive human causality of undesirable climatic fluctuations. This is how they propagated their big lie. The emphases are mine. Note in particular that the IPCC’s variations are determined from proxy and satellite observations and not direct calculations. Why did they not carry out direct calculations based on the variations in the earth-to-sun distance? The answer is obvious. IPCC third assessment report, 2001, working group 1, section C6. Radiative forcing of the climate system due to solar irradiance change is estimated to be 0.3 ± -0.2Wm-2 for the period 1750 to the present. Most of the change is estimated to have occurred during the first half of the 20th century. The fundamental source of all energy in the earth’s climate system is radiation from the sun. Therefore, variation in solar output is a radiative forcing agent. The absolute value of the spectrally integrated total solar irradiance (TSI) incident on the earth is not known to better than about 4Wm-2, but satellite observations since the late 1970s show relative variations over the past two solar 11-year activity cycles of about 0.1%, which is equivalent to a variation in radiative forcing of about 0.2 Wm-2 . Variations over longer periods may have been larger, but the techniques used to reconstruct historical values of TSI from proxy observations (e.g.sunspots) have not been adequately verified. 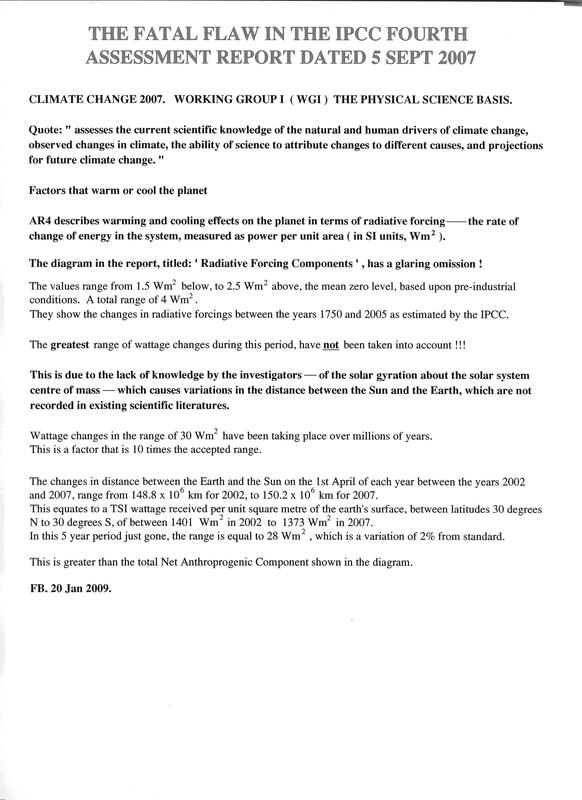 IPCC fourth assessment report, 2007, working group 1, section 2.2. There is a very high confidence that the global average net effect of human activities since 1750 has been one of warming, with a radiative forcing of +1.6 [+0.6 to +2.4] Wm-2. In comparison, changes in solar irradiance since 1750 are estimated to have caused a small radiative forcing of about +0.12 [+0.06 to + 0.30] Wm-2, which is less than half the estimate given in the third assessment report. Figure 2.4 of the report provides the following radiative forcing components. However, Fred Bailey calculated that for the past five years the range was equal to 28 Wm-2 compared with the IPCC’s estimate of the anthropogenic component of 1.6 Wm-2 ! The solar influence is therefore 17.5 times greater than the human influence. No wonder the IPCC cooked the books. For the past 30 years I have repeatedly demonstrated that there is NO evidence in the hydro-climatological data of human-caused abnormalities against the background of the undeniable evidence of the influence of variations in solar activity. The IPCC’s fourth assessment report will be discussed at the Midrand Summit. It will be very interesting to hear how the presenter treats this problem. Will he quote the overwhelming ignorance of the vast majority of climate alarmists? How will he account for undeniable linkage with the hydroclimatological processes described in our joint paper? For the past two years I have repeatedly drawn attention to the probable occurrence of severe global droughts from 2009 to 2016. This warning is described in detail in my article The likelihood of a global drought in 2009 – 2016 <click here to read>, published in Civil Engineering in June 2008. There are already signs of a developing drought in parts of South Africa. Other parts of Africa are in the grip of a drought but confirmation is difficult. Argentina is also currently experiencing a severe drought. The country faces a potential loss of revenue from agricultural production of US$4.4 billion. My prediction is based on the observed, regular and therefore predictable, periodicity in the hydrometeorological data. The existence of this periodicity is denied by climate alarmists. Soon it will be far too late to take any action to avoid the consequences, particularly to the rural and farming communities as well as the water supply authorities. See – I told you it was interesting. Now – what do YOU think? Here are a few excerpts from the interview with James Lovelock. It is interesting that James Lovelock has a rather fatalistic view on global warming. He does, however, propose one action which has a chance of “saving the world”. Your work on atmospheric chlorofluorocarbons led eventually to a global CFC ban that saved us from ozone-layer depletion. Do we have time to do a similar thing with carbon emissions to save ourselves from climate change? Not a hope in hell. Most of the “green” stuff is verging on a gigantic scam. Carbon trading, with its huge government subsidies, is just what finance and industry wanted. It’s not going to do a damn thing about climate change, but it’ll make a lot of money for a lot of people and postpone the moment of reckoning. I am not against renewable energy, but to spoil all the decent countryside in the UK with wind farms is driving me mad. It’s absolutely unnecessary, and it takes 2500 square kilometres to produce a gigawatt – that’s an awful lot of countryside. There is one way we could save ourselves and that is through the massive burial of charcoal. It would mean farmers turning all their agricultural waste – which contains carbon that the plants have spent the summer sequestering – into non-biodegradable charcoal, and burying it in the soil. Then you can start shifting really hefty quantities of carbon out of the system and pull the CO2 down quite fast. Would it make enough of a difference? Yes. The biosphere pumps out 550 gigatonnes of carbon yearly; we put in only 30 gigatonnes. Ninety-nine per cent of the carbon that is fixed by plants is released back into the atmosphere within a year or so by consumers like bacteria, nematodes and worms. What we can do is cheat those consumers by getting farmers to burn their crop waste at very low oxygen levels to turn it into charcoal, which the farmer then ploughs into the field. A little CO2is released but the bulk of it gets converted to carbon. You get a few per cent of biofuel as a by-product of the combustion process, which the farmer can sell. This scheme would need no subsidy: the farmer would make a profit. This is the one thing we can do that will make a difference, but I bet they won’t do it. But still he is optomistic …. Do you think we will survive? I’m an optimistic pessimist. I think it’s wrong to assume we’ll survive 2 °C of warming: there are already too many people on Earth. At 4 °C we could not survive with even one-tenth of our current population. The reason is we would not find enough food, unless we synthesised it. Because of this, the cull during this century is going to be huge, up to 90 per cent. The number of people remaining at the end of the century will probably be a billion or less. It has happened before: between the ice ages there were bottlenecks when there were only 2000 people left. It’s happening again. OK, so he is a global warming alarmist. I also think it safe to say he is not a creationist. What alarms me is the extremes to which global warming alarmists propose we go in order to reduce atmospheric carbon dioxide. Let’s think through the charcoal burying idea. The idea is to lock the carbon into charcoal, and prevent microbes from consuming dead leaves etc and exhaling CO2 as a bi-product. So, we should starve off a few billion microbes, close to the bottom of the food chain, to replace the fossil fuels we burn with charcoal which we then bury? Just how much biological waste do they propose turning into charcoal? What will the effect on the food chain be? What about soil quality and fertility? There must be a better answer than this. If you are a science fiction fan, you will have heard humans referred to as carbon based life forms. In fact, all living creatures on Earth are based on carbon. Carbon is the basic element in our web of life. Plants are made of carbon and water and assorted other molecules – from phytoplankton to massive trees. Fungi and algae are made of carbon. Animals from bacteria to whales are made of carbon. Carbon is one of the elements in proteins. People and animals get energy from carbohydrates – which are made up of carbon, hydrogen and oxygen. People and animals store energy in their bodies in fat – again includes carbon. People need energy to sustain life and a standard of living. Most energy sources used by man throughout history are based on either a carbohydrate – eg timber – or a hydrocarbon – eg oil, kerosene. Carbon is taken in at the beginning of the food chain, and built upon as successive species consume the previous one. Where does it start? With plants of course. Plants use the process called photosynthesis to absorb energy from the sun, absorb water and carbon dioxide, and use the sun’s energy to create proteins and carbohydrates from these. Plants keep the carbon and some of the water, and transpire oxygen and water as their waste products. Carbon dioxide is essential for plant life. If you want a farm animal to grow faster, you feed it more. If you want a plant to grow bigger or faster, you give it more carbon dioxide. Plants are an essential part of our food chain, and of sustaining habitat for fish, birds and animals. No plants, no other life. Therefore carbon is an essential element of life. Carbon is not a poison. It should not be treated as one. If greenhouse gases are causing global warming, then we need to eliminate oxygen to rid our planet of greenhouse gases. Four of the major GHG’s include oxygen! Our atmosphere now has about 21% oxygen – oxygen molecules just floating around waiting to form into one of these greenhouse gases! Oxygen is also responsible for devastating bush fires around the globe every year – fires need oxygen. So where is all of this terrible oxygen coming from? Plants! That grass, the flowers, shrubs and trees you planted around your home because they “look nice” are actually poisoning our atmosphere with oxygen! Scientists have discovered that plants create oxygen through a complex process called photosynthesis. Plants absorb sunlight (that’s right – plants are even stealing our light source!) through chlorophyll (the stuff that makes them look green) and absorb CO2 from the atmosphere, keep the carbon to themselves and transpire oxygen and water vapour – the two most populous greenhouse gases! This is a world wide emergency! What can be done about all of this oxygen! What’s worse, scientists have discovered that growing plants create more oxygen than unhealthy plants, and computer models show that these plants will continue to grow at more than 10% a year unless we do something about this! Firstly, we need to stop more oxygen being added to the atmosphere. We need to rid the planet of all of these plants. That won’t be easy, especially as scientists have discovered plants called algae live in our oceans, seas and rivers. Secondly, we need to remove all oxygen from the atmosphere somehow and bury it underground. This will require very complex new science, so governments around the world will need to dedicate billions of dollars to research to study the effects of oxygen and discover how to safely remove it from our atmosphere. What was that? People need to breath oxygen? We can’t have that! What a terrible addiction! In that case we also need every government to prepare a National Adaptation Program Assessment to show how they will assist their people to wean themselves off this silly addiction and lodge it with the United Nations. In fact, with such a looming catastrophe of global proportions, the UN had better set up a new coordinating body. I suggest IPOD – Intergovernmental Panel for Oxygen Destruction. They will need to have frequent meetings at different places all around the globe to demonstrate their commitment to this serious problem. Meetings will probably be held in forests, surrounded by the cause of this problem, to remind people of the purpose of the cause. What do you mean, don’t be ridiculous? Are you denying that oxygen forms part of most greenhouse gases and that the atmosphere is 21% oxygen? Are you doubting years of scientific research which has proven that photosynthesis is the main cause of this oxygen? Spread the word and share your ideas on how to save the world from oxygen! I was told about an Australian news item that I just couldn’t believe was real. I looked it up, and sure enough, it was real all right! Dr Tim Flannery is a scientist – and 2007 Australian of the Year! He is quoted by AAP, and therefore news all around the world, as having stated in a public address at Australia’s Parliament House that drastic measures are needed to curb global warming, including adding sulphur to plane fuel so that sulphur could be dispersed into the atmosphere and create cloud cover, and setting up an eBay style carbon trading scheme. I know, I didn’t believe it either. Check out the 19 May 2008 story “Tim Flannery’s Radical Climate Change “Solution”” at news.com.au. And he admits to having no idea what adding sulphur to the atmosphere would do to the planet! Is this scientific statement as responsible as others that have been published? Today’s newspaper articles on a paper published in Science state that the scientists attribute the declining rate of growth of a particular type of coral to climate change and increasing acidity in the ocean due to greater absorption of CO2. The causes of the decline remain unknown; however, this study suggests that increasing temperature stress and a declining saturation state of seawater aragonite may be diminishing the ability of GBR corals to deposit calcium carbonate. The scientists Glenn De’ath, Janice M. Lough, Katharina E. Fabricius of the Australian Institute of Marine Science report that their data suggests that the decrease in calcification of 14.2% since 1990 is unprecedented in the past 400 years. Aragonite is CaCO3 – a form of calcium carbonate. It makes sense that this is important to coral growth. But what might be reducing the saturation of aragonite in seawater around the Great Barrier Reef? On further research I found that CO2 reacts with H2O and CaCO3 to make Ca and H2CO3 – carbonic acid! Aha – so that is why the oceans are becoming more acidic. So what happened to corals much more than 400 years ago? The Earth was at least as warm, some say warmer, in the Medieval times. Coral was around then, so how did it cope? Maybe the answer is in slower growth, not killing. The coral is growing more slowly, but will recover again when the temperatures reduce with the next Little Ice Age. What is happening with coral in other locations around the world? What will happen/ has happened to coral when the planet cools? Coral seems to be pretty resilient. It has survived Crown of Thorns plagues, bleaching episodes and massive quantities of superphosphate washing out of Queensland rivers. I would like to see more studies of what has happened to corals over time with other unfavourable events. As for the scientists claim that this is due to global warming from man-made CO2 (as at least one stated on camera), I didn’t see any reference to their proof that CO2 is increasing in the atmosphere due to man made causes, nor that this is causing global warming. All that can be concluded is (possibly) that the rate of growth of one type of coral in the Great Barrier Reef has been slower recently than it has in the past. Am I correct in understanding that the coral is STILL GROWING, just 14.2% more slowly? US to announce War Against Global Warming? Reuters has just posted news that US President elect Obama has filled his new administration with AGW proponents. President-elect Barack Obama‘s new “green dream team” is committed to battling climate change and ready to push for big policy reforms, in stark contrast with the Bush administration, environmental advocates said on Monday. “If this team can’t advance strong national policy on global warming, then no one can,” said Kevin Knobloch, president of the Union of Concerned Scientists, referring to Obama’s picks for the top energy and environment jobs in his administration, which takes office on January 20. Just great! From the country that brought us the war in IRAQ, the global financial collapse, ENRON and other startling failures, they are now going to inflict on us the perpetuation of the man made CO2 is bad for us myth. … Karpinski said that with Obama’s “great new green dream team” and more members in the U.S. Congress who support action to curb climate change, a law to limit greenhouse gas emissions is more likely, as is a global agreement to succeed the current phase of the carbon-capping Kyoto Protocol. Or is this just wishful thinking by the AGW proponents? At least they didn’t mention an emissions trading scheme, or is that what they mean by a “law to limit greenhouse gas emissions”? Policy to protect the environment is good, but only if it is directed at the real causes and takes action that is going to make a real difference.